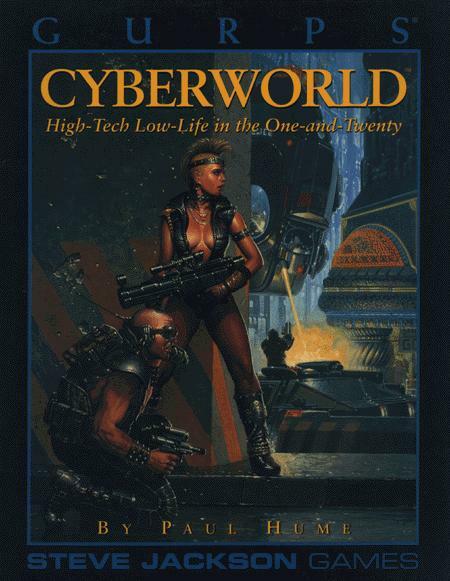 GURPS Cyberworld is your guide to the world of the One-and-Twenty, where the United States is under the totalitarian hold of the Provisional Government, the cities are floundering in their own decay and technology races faster and faster. This book has everything players and GMs need to explore a dangerous and brutal world. If you're quick enough, you can outwit the black-clad Nerks, get enough cred and connections to fix yourself up with some street cyberwear, and maybe even jack into the global net and poke around for some easy loot. But if the korp console jockeys catch you in part of the matrix, you'll be dodging zeromen for the rest of your short life. 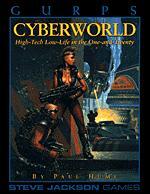 GURPS Cyberpunk – The fusion of science fiction and "noir," a world in which the street finds its own uses for the gifts of science.